Chondropetalum elephantinum in a Santa Barbara Garden. 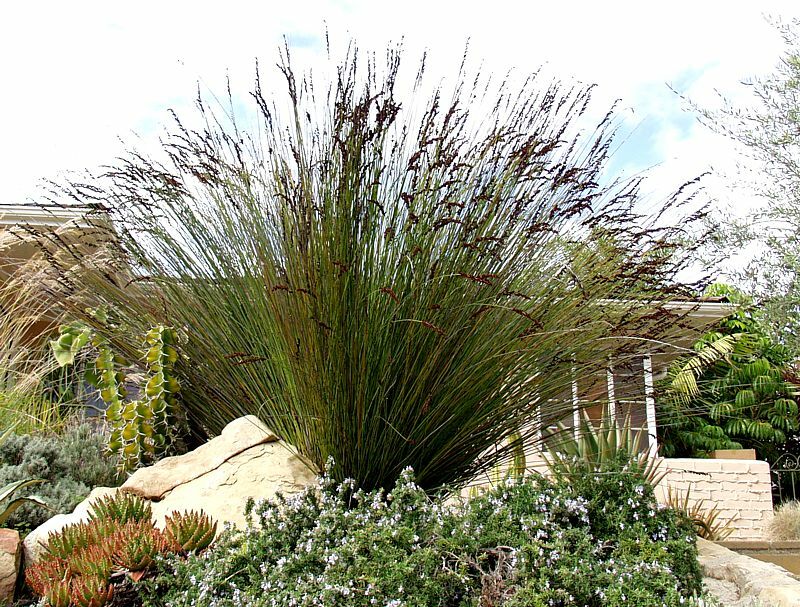 For many years San Marcos Growers has grown a large beautiful grass-like plant from South Africa that we called Cape Rush or Chondropetalum tectorum. We first became aware of the existence of this plant in 1988 when our Monrovia Nursery salesman, brought in a sample of the plant and explained that Monrovia Nursery had evaluated the plant, but it was not going to put it into production. We thought the plant very interesting and purchased all of the plants that were then available. Audrey Teasdale, Monrovia's botanist, informed us that Monrovia received the seed for this crop from Kirstenbosch Botanic Garden, who had collected the seed on Mt Lebannon, East of Capetown, South Africa. These plants from Monrovia Nursery were possibly the first introduction of a "Restio" (as plants in the Restionaceae are referred to) into the California horticultural trade. Chondropetalum tectorum has since become a very popular plant that is widely planted in gardens throughout California and many other Restios are also now available. In 2003 a change of the nomenclature of this plant was announced that split what was considered one species, now into two, causing a great deal of confusion. Although we have yet to read the monograph that discusses this change, we have been assured by Rachel Saunders of Silverhill Seed Company that Dr. Hans Peter Linder (professor at the University of Zurich Institute for Systematical Botany and co-author of the "Restios of the Fynbos") has determined that that the large population of Chondropetalum that grows along the west coast near Cape Town is taxonomically different from another small population of plants found further from Cape Town. Dr. Linder has assigned the name Chondropetalum elephantinum to the population that is closer to Cape Town as it is typically a larger plant, growing to 2 meters tall. He retained the name Chondropetalum tectorum for the other population that only grows to 1 meter tall. Due to the known location of the seed collection sites, we have been assured that most likely all, or nearly all, of the seed collected and sent out over the years from Silverhill Seed Company as Chondropetalum tectorum was from the large form now called Chondropetalum elephantinum. Because of this and because all plants that we have grown appear to be this larger form, San Marcos Growers has decided to change the name on the plants we currently sell from Chondropetalum tectorum to Chondropetalum elephantinum. We recognize that this name change will take a while to be recognized; In 2003 San Marcos Growers was the only nursery that made this name change but many have since followed suit, yet over 10 years later many of the the plants in the nursery trade offered as Chondropetalum tectorum are actually the larger Chondropetalum elephantinum. For more information on this name change please visit our Chondropetalum Nomenclature Page. In 2005 San Marcos Growers released it first crops of the smaller “true” Chondropetalum tectorum and to further distinguish these plants we will be using the common name “Small Cape Rush” for Chondropetalum tectorum and “Large Cape Rush” for Chondropetalum elephantinum. In the most recent treatment of these plants both species have been included in the genus Elegia, so the correct name now for each is Elegia elephantina and Elegia tectorum.